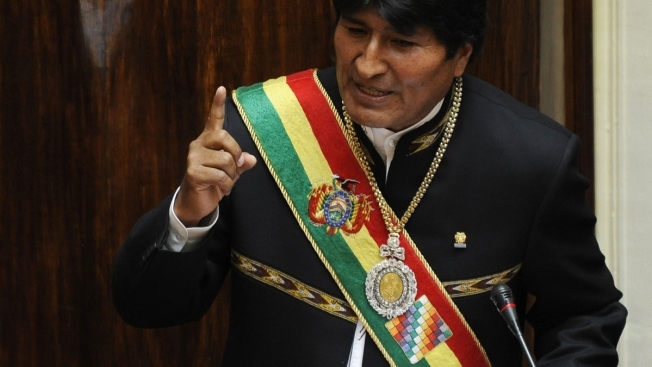 This Jan. 22, 2013, file photo shows Bolivian President Evo Morales wearing presidential regalia during a speech in La Paz. The regalia were briefly stolen, forcing Morales to appear at a military parade without them Wednesday, August 8, 2018. Thieves made off with the Bolivian president's diamond-encrusted gold medallion and the sash it's worn on, NBC News reported. The nearly 200-year-old regalia were swiped from a backpack that a soldier left inside a car in the red-light district of El Alto. But authorities receovered them when they were abandoned outside a church in nearby La Paz. "We are talking about the most important national symbol," former President Carlos Mesa told local media. "It is as if they robbed the crown of Queen Elizabeth of England." Current President Evo Morales had to appear at a military parade without the regalia Wednesday.